A construction crane has collapsed in the Siberian city of Krasnoyarsk, smashing into nearby traffic. Six people were hurt in the accident, two of whom sustained serious injuries. The accident occurred on Friday in late afternoon. The high-rise crane snapped at its foundation and fell onto the adjacent highway, burying nine passenger cars and stalling all traffic. The plunging crane landed only a meter away from a nearby bus stop. Rescuers are working at the site to remove the metal debris and unblock traffic. The crane is allegedly the property of the local “Omega” construction company. This is yet another instance of the crane collapses that have recently resounded throughout Russia. A few months ago a crane crashed in the city of Kirov, killing its operator. 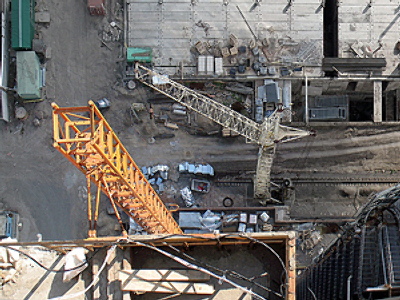 In October 2009, another crane collapsed in the Krasnodar region, killing two and injuring four. While in March last year, a plunging construction crane hit a residential building in the city of Nizhny Novgorod, killing a young woman and a small child.